Happy Rock the Dots Day! What's Rock the Dots Day you may ask? Well, today is all about rocking polka dots, red, bows, and all things Minnie style. 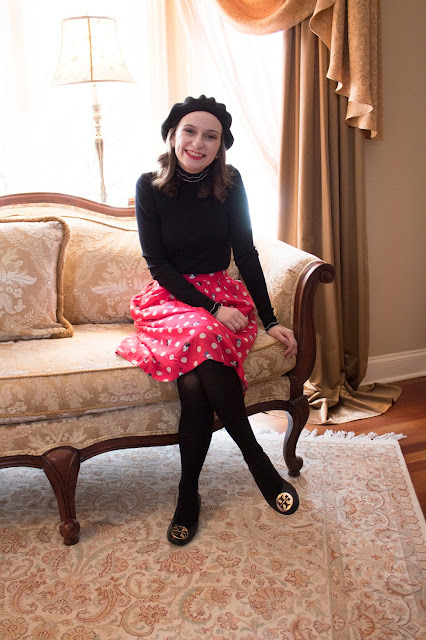 I love incorporating Disney style into my everyday life. 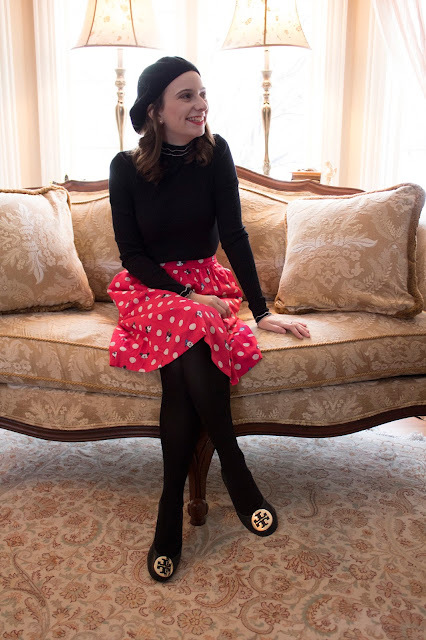 Whether it is dressing Minnie inspired or wear a skirt decked out in Mickey and Minnie heads there are so many ways to add a dose of Disney to your daily look. 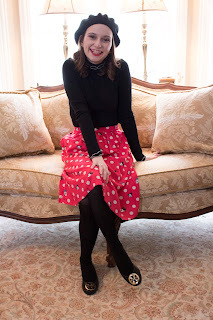 For this look I styled this adorable Cath Kidston skirt I picked up from their last Disney collaboration. It is covered in Mickey, Minnie, Daisy, Donald, and Pluto heads. And of course giant polka dots! This skirt is perfect for Rock the Dots Day. 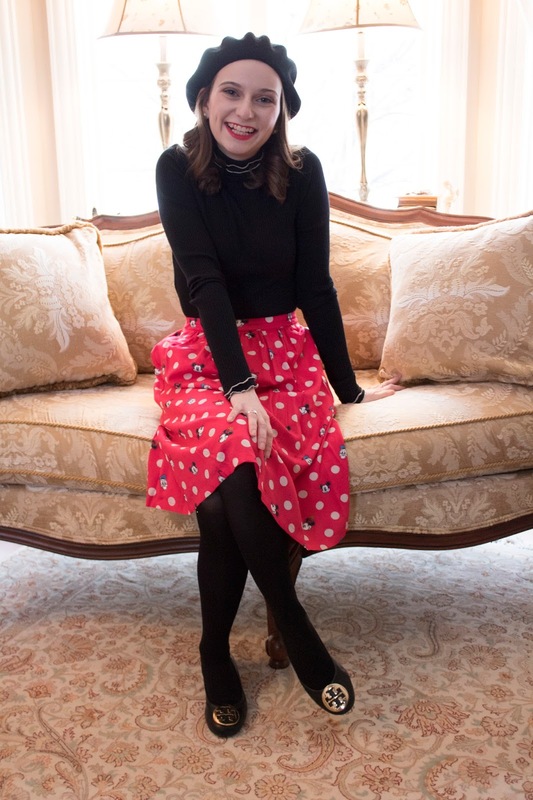 Since this skirt is very vibrant and has a large pattern I kept things simple on top with a black turtle neck. 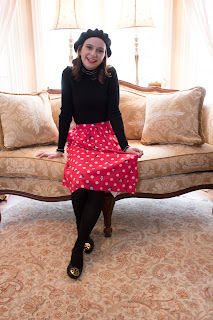 The little white detailing on the ruffle is giving me major vintage Minnie vibes. 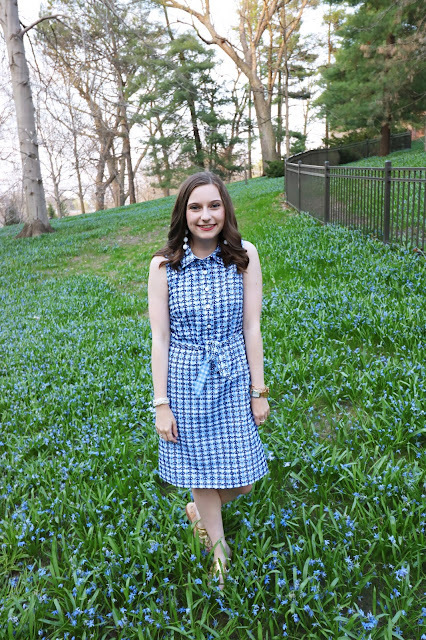 My biggest rule of thumb when it comes to a print like this skirt has is balancing everything out. Keep things simple and focus on one major show piece in your look! Since I live in Illinois and it's freezing as crud a hat is a necessary accessory. Berets are one of my favorite cold weather accessories. 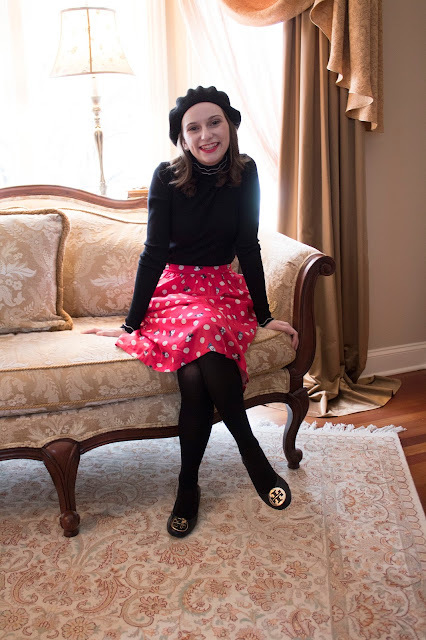 I may not have a Minnie mouse hat, but I think she would approve of this adorable little black beret. Plus it has little sparkly stones on the top, which gives it a glamours touch. Minnie is such a style icon, in my eyes. Her look has changed over the years, but she is still as stylish as ever! 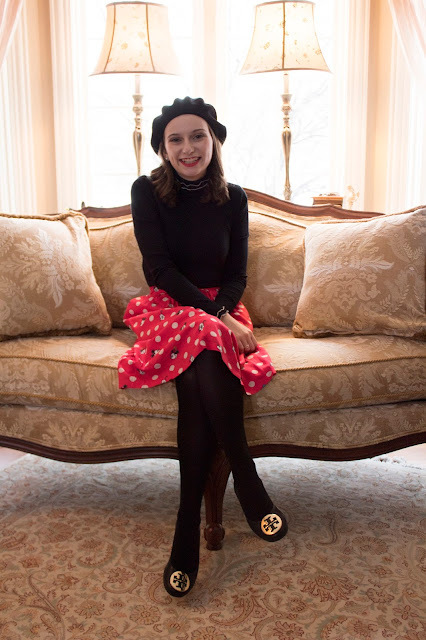 Want more Minnie style inspiration? 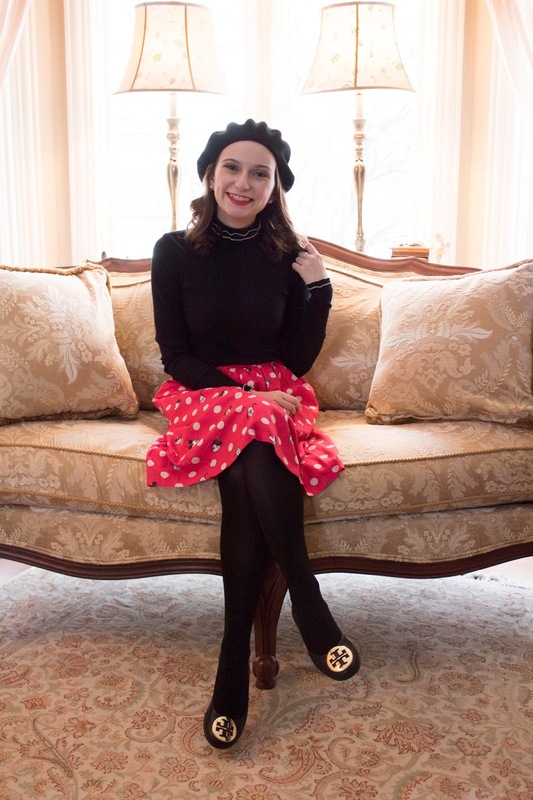 Check out @minniestyle on Instagram for more inspo and see more ways you can incorporate Minnie into your style. Are you rocking your dots today? 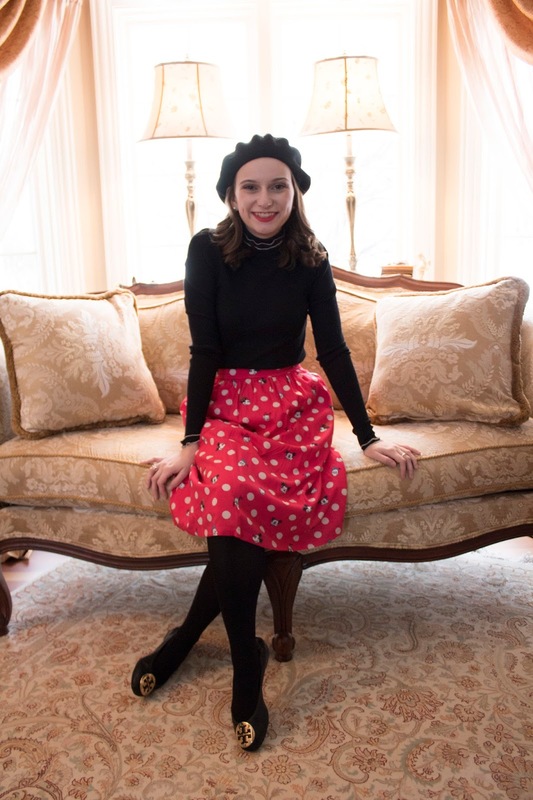 Let me know how you incorporate Disney style into your everyday look!